There is no doubt left on the matter of prayer at School District 51 graduation ceremonies: School-sponsored prayers are not permitted at District 51 graduation ceremonies. Some parents this year objected to prayers being included in Palisade High Schools’ graduation ceremony, and rightly so. It violated federal law, and school district policy. 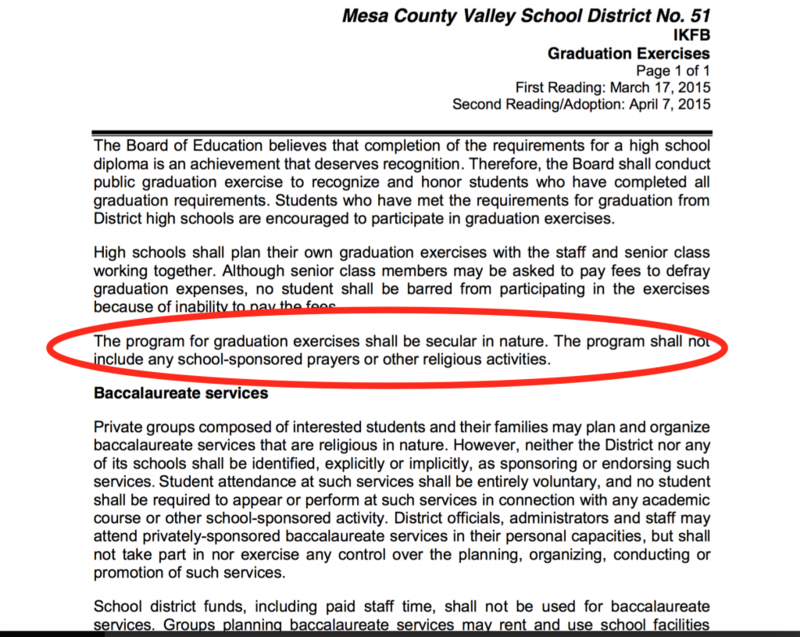 On April 7, 2015, District 51 formally adopted Policy IKFB (pdf) titled “Graduation Exercises,” which prohibits prayers at graduation ceremonies and specifically prohibits school participation in religious baccalaureate ceremonies. The D-51 School Board formally adopted Policy IKFB after Fruita Monument High School orchestra students reported in 2014 that they were forced under threats to play at the school’s religious baccalaureate ceremony. A concerned adult contacted the Freedom From Religion Foundation, which sent a legal letter (pdf) to D-51 Superintendent Steve Schultz explaining why such coercion is illegal, and why school participation in religious baccalaureates violates U.S. law. Fortunately, the school district understood, agreed, and put in place a policy to assure compliance with federal law in the future. The policy is also clear in regard to religious baccalaureate ceremonies: Schools cannot participate in or endorse these ceremonies, and students cannot be forced to attend them. Private groups composed of interested students and their families may plan and organize baccalaureate services that are religious in nature. However, neither the District nor any of its schools shall be identified, explicitly or implicitly, as sponsoring or endorsing such services. Student attendance at such services shall be entirely voluntary, and no student shall be required to appear or perform at such services in connection with any academic course or other school-sponsored activity. District officials, administrators and staff may attend privately-sponsored baccalaureate services in their personal capacities, but shall not take part in nor exercise any control over the planning, organizing, conducting or promotion of such services. School district funds, including paid staff time, shall not be used for baccalaureate services. Groups planning baccalaureate services may rent and use school facilities under the terms, conditions and rates prescribed by the district. District 51 deserves thanks and recognition for doing the right thing and putting this policy in place. Now the schools must follow it. Thanks for reporting this, all religious activities should be personal with no coercion by others to participate especially by those with power over others. Oh my yes, just what the Dr ordered. Compliance with federal law. Oh we’re going to need a whole bunch more of that both on the east coast and the west coast. Tell me, do you think the continuation of federal funding had anything to do with that decision for District 51? Well, then, if it can work in a whole district, there’s no reason it shouldn’t work in say, a sanctuary city or state? But heck isn’t it great now that we have bipartisan support, going forward?